is a fully insured, Virginia Class A building contractor. Our specialty is fine woodworking on vintage homes and buildings, including on-site carpentry as well as shop-built millwork. Our projects range from simple old house repairs to museum-quality restorations. Residential, commercial, and ecclesiastical work are all welcome. We also build new homes and additions in the old-time way. 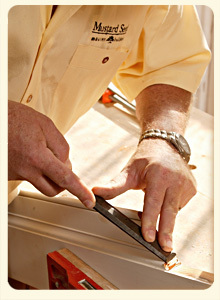 We work directly with property owners, or as carpentry subcontractors for other builders. If the job is close to home (central Virginia) we offer general contracting services as well. Through the years we have developed relationships with a select group of dependable, highly experienced subcontractors.